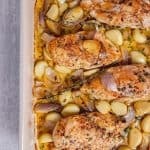 Juicy chicken breast surrounded by roasted garlic and shallots in a white wine cream sauce. Season chicken breast with salt and pepper on each side. In a large cast iron skillet over medium/high heat, add 1 tbsp of olive oil and 1 tbsp of butter. Sear chicken breast about 6 minutes on each side. Transfer to baking dish. Lower the heat to medium and add shallots, garlic, and 1 tbsp fresh thyme leaves. Cook for about 5 minutes, stirring frequently, remove and spoon over chicken in baking dish. Add white wine to skillet and allow pan to deglaze for about 5 minutes or until liquid has reduced by half. Add in chicken broth, 1 tbsp butter, rosemary, red pepper flakes, and cream. Allow to come to a light boil, and reduce to simmer. Allow to simmer for 2 minutes, then carefully pour over the chicken. Add fresh thyme sprigs over the top and place into the oven. Bake for 35 minutes until chicken is fully cooked through. Serve over pasta, or rice, or your favorite vegetables. Spoon sauce over chicken. Enjoy!